We offer a variety of treatment options for both family and cosmetic dentistry for adults, teens and children– such as Invisalign, all-porcelain crowns and fillings to optimally match the color of your teeth. Below is a list of treatments and services that we currently offer to our patients. Please contact us if you have any treatment questions. We recommend seeing children around 3 years of age for their first visit. This ensures that they have positive visits early on in life which can lead a habit of lifelong regular check-ups. Also, if there is a need to be addressed, it can be taken care of while the problem is small. Issues of the TMJ range from quite simple to very complex. We will discuss these issues with you and determine the best solution for your individual problem. Often times, simple devices can be fabricated to stop snoring. The device repositions the jaw while you are sleeping to give you (and loved ones) a better night’s sleep. Root Canal Therapy is no longer the torturous experience as in days of old. Using modern anesthetics and the most advanced technology available, the process is more akin to having a tooth filled. Patients who require a root canal will tend to experience one or more of the following symptoms: throbbing pain, sensitivity to heat, swelling, pressure and pain that wakes them up at night. Dr. Brassell will examine the tooth and take a digital x-ray in order to make a diagnosis. It is always our goal for the patient’s optimal future dental health to restore and save every tooth. 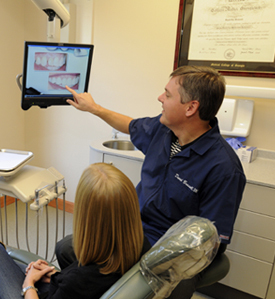 If an extraction is necessary, Dr. Brassell will take a digital x-ray, evaluate the tooth and perform the extraction. A series of aligners that are used to straighten teeth. Not only are they clear, but you take them out to eat, brush, and floss! Veneers are considered cosmetic dentistry. They are very thin porcelain restorations that require minimal tooth prep and usually cover the front of the tooth. They are aesthetically beautiful and are primarily placed on anterior teeth. We offer all porcelain crowns and tooth colored fillings that are not noticeable. A Crown is a restoration that completely covers the visible portion of a tooth. A crown may be suggested if a patient has sensitivity to cold or pressure. As we age, teeth can crack, with these, comes the high risk of breakage. Teeth can re-decay around older chipped fillings which would also necessitate a crown. Unlike amalgam fillings that grey, composite fillings come in a variety of shades to optimally match your teeth. They are virtually invisible to anyone except a hygienist or dentist! If, after an examination, you are found to be a candidate for implants, Dr. Brassell will partner with a local Periodontist or Oral surgeon. Their office will place the implant and our office will place the Implant Crown. We use the Opalescence Whitening System. This is very convenient for the patient because he or she then controls how much or how little to lighten, at their own pace. We fabricate trays and instruct the patient in the safe & proper use of whitening gel and trays.